Greetings fellow waterfallers and explorers to the latest instalment of The Waterfall Trip, Volume 2! Last time in Part 1, we visited 5 waterfalls which stretched from outside of Berea to the Daniel Boone National Forest a few miles downstream from Cumberland Falls. Here, with Part 2 we’re going to pick up with where we left off and begin with the big fall itself, Cumberland Falls. Then we will make our way into the less visited Big South Fork National River and Recreation Area, and then back into the Daniel Boone National Forest. So take a seat and let’s continue on our journey to Kentucky's beautiful falling waterways. Below is a map that shows the location of the waterfalls as well as the trails to them. Zoom into a particular waterfall to see the details and a link to more information on the particular waterfall. This is the mother of all Kentucky Waterfalls, nicknamed "The Niagara Of The South". At 125 ft wide and 68 ft tall and located on the Cumberland River, it is the highest volume waterfall in the eastern United States, south of Niagara Falls. 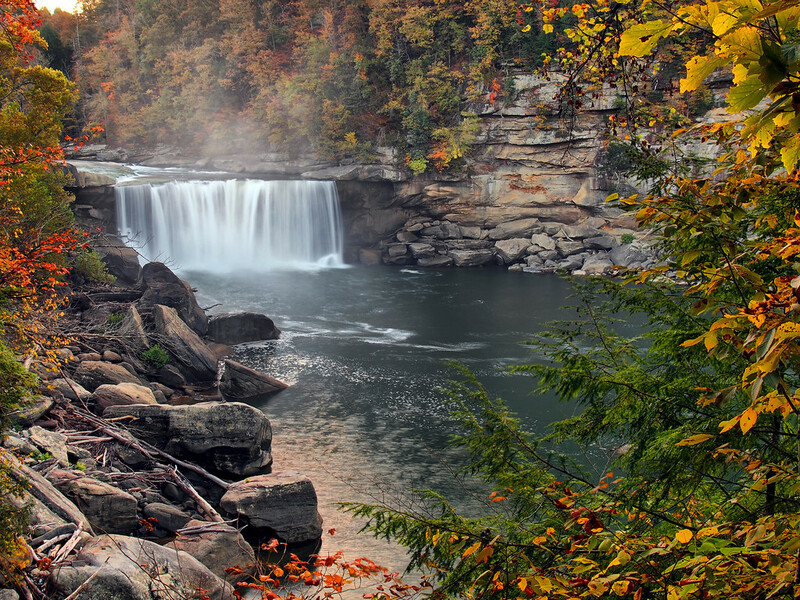 The falls is located in Cumberland Falls State Resort Park which is a located a little less than 15 miles from I-75 at the Corbin Exit on KY 90. A large parking lot awaits visitors, the traditional overlooks are easy, and most are wheelchair accessible. Another option is to head out the Eagle Falls trail on the opposite side of the river for a bird's eye view of both the main falls and the gorge. Cumberland Falls is also the only waterfall in the Western Hemisphere which has a year-round predictable moonbow visible a few days before, during and a few days after every full moon. The traditional overlooks are open until midnight. 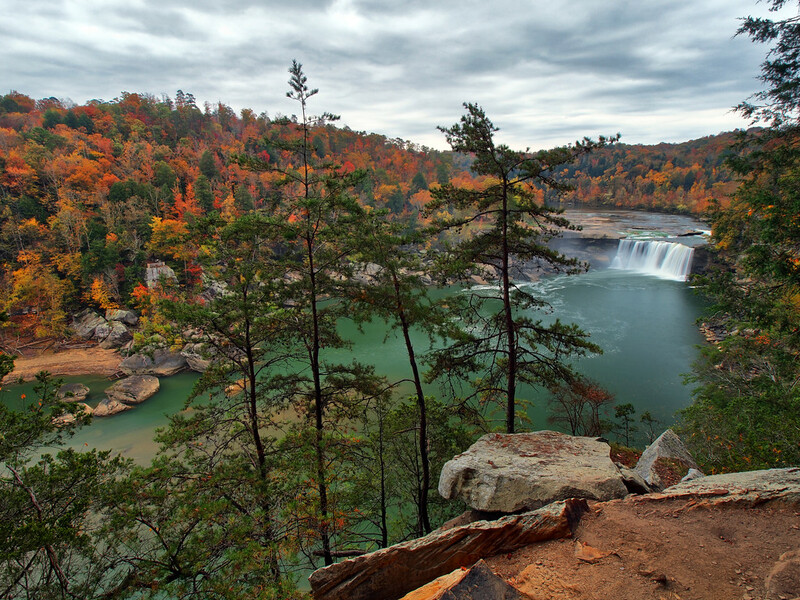 The #1 rated hike in the state, and for good reason, located in Cumberland Falls State Resort Park on the opposite side of the river from the visitor centre, the Eagle Falls Trail aka Trail #9 is a moderate/strenuous hike with some decent elevation change. If you are interested in just the falls, the trek is ¾ a mile, however, the trail is also a loop trail. The falls then is merely a side trip, in that case, making it a 2-mile round trip. The trailhead is located on KY 90 just before it begins its ascent from river level en-route to US 27, the trail offers sweeping views of both the gorge and of Cumberland Falls itself. 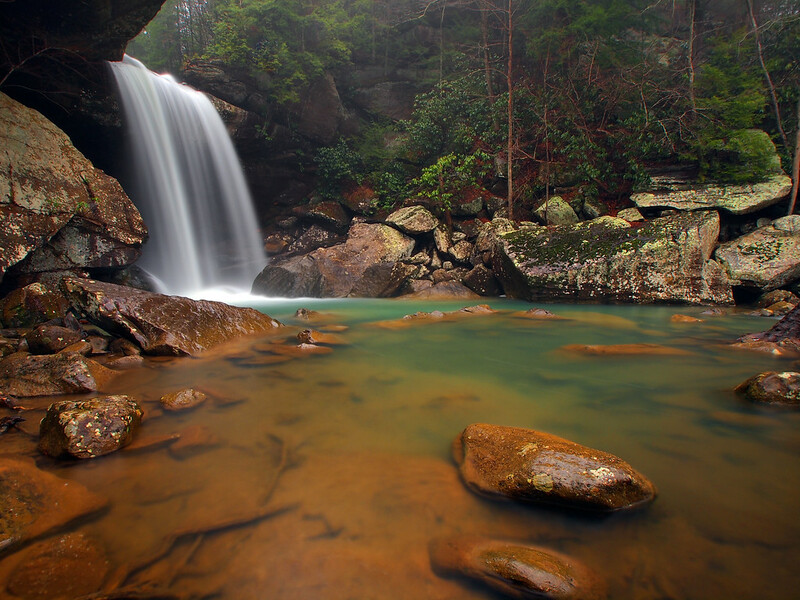 The big payoff is the beautiful 40 ft tall Eagle Falls located in a boulder-strewn grotto. On the weekend the trail and the falls can be crowded, and in times of very high water, the falls is inaccessible. The view of Cumberland Falls from the Eagle Falls Trail. Marcus Falls is a waterfall that has only become know to the waterfalling community just recently. 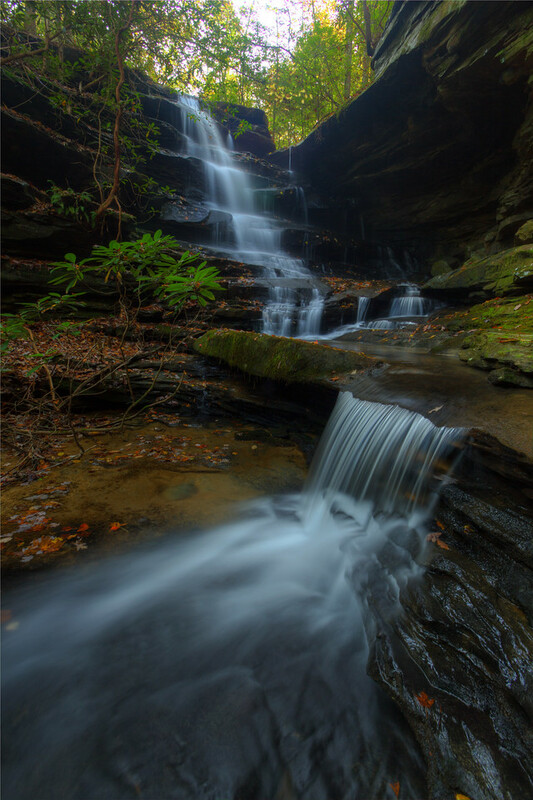 Located off KY 1045 on Forest Road 6240 a short distance from US 27 in Daniel Boone National Forest, it’s an easy hike to view the falls from above, however from below it is a different story. Where FR 6240 ends park there and continue down the old roadbed. It is a short hike to the watershed above the falls. Keep in mind that this is a wet weather waterfall, so if it’s been dry don’t even bother to go see it unless you like to go exploring. Cross the creek and follow it downstream (to the left) where you’ll come to the edge of a mini-gorge, with the falls being on your left. If you want to go below it requires a 20 ft scramble that, depending on your skill level, can be easy or scary. If it’s scary, you can cross the creek a short distance upstream and follow the cliff line on the opposite side for a nice open view of the falls from above. If you are comfortable scrambling down into the gorge you are rewarded with a gorgeous cascading 28 ft tall waterfall. Want to explore? Continue downstream through the mini-slot canyon and visit several smaller cascades and waterfalls as it meets up with Cogur Fork. Considered Kentucky’s tallest waterfall at 109 ft, Yahoo Falls is located in the Big South Fork National River and Recreation Area north of Whitley City on the now paved Forest Road #660 off KY 700. At the trailhead parking for the falls is a lovely overlook looking west over the Big South Fork Of The Cumberland River and is an excellent place for photographers to capture the sunset. The trail to the falls itself is a 1 mile easy/moderate loop trail. One can also continue on a side trail to the unique Yahoo Arch 3/4th of a mile off the main loop trail. Depending on the recent weather, the falls itself can either be impressive or a huge disappointment. In drier conditions the falls is just a drip, however, a decent rain will get it flowing nicely. 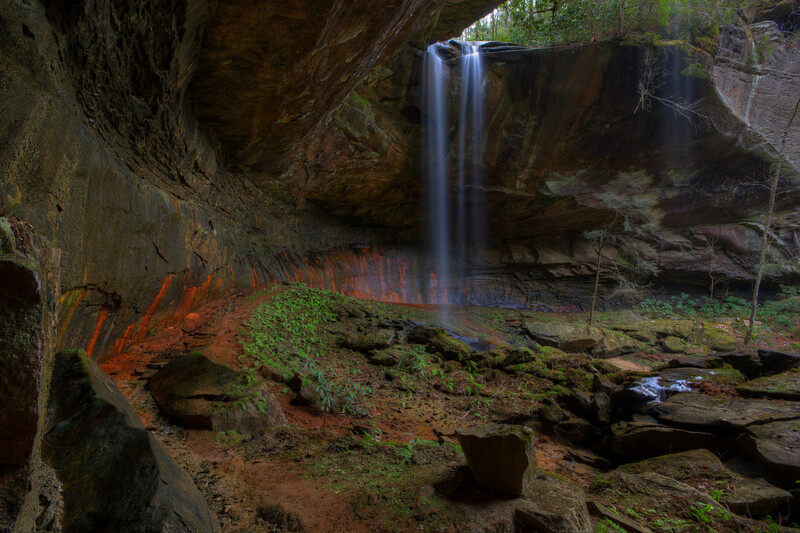 Even if there hasn’t been much rain the falls is still worth a visit just because of the massive rock shelter that surrounds it, which is comparable to the size of Ash Cave in Hocking Hills State Park in Ohio. Once at the rock house there are several side trails that offer ground-level views of the falls. A note, there are several steps on the left approximately 0.2 miles from the parking lot as you begin the hike, going down the steps and taking the trail through the gorge first makes for a much easier hike. These two falls are placed together because of their 'close' proximity of one another and there are several options as to how one would want to approach visiting the falls either together, or individually. Located just outside the Big South Fork National River and Recreation Area in the Daniel Boone National Forest, Lick Creek Falls, which isn’t actually on Lick Creek but on a tributary, is a towering 64 ft tall plunge style waterfall. 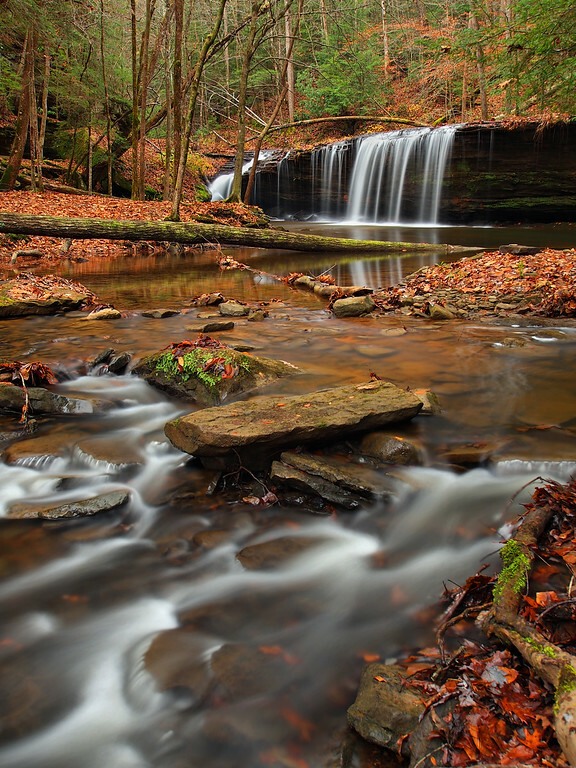 Whereas Princess Falls is a 20 ft tall, wide creek waterfall on Lick Creek itself. For the sake of making things easier, we’ll first begin the trip from on top of the ridge as a point to point hike, which is around a total of 7 miles, making for a great day hike. Parking at the 631 Lick Creek Trailhead 100 ft. off KY 1651 on Forest Road 622, it is nearly 3 miles to Lick Creek Falls. The first mile or so of the hike follows an old roadbed along the ridge but you soon drop down 300 ft. below the cliff line over 0.5 of a mile and begin to follow a tributary of Lick Creek eventually meeting up with Lick Creek itself passing by gorgeous and unique rock formations. At mile 2.25 from the trailhead, you will meet with the Lick Creek Falls Trail #631A to the left, and follow that trail to view the falls. The side trail to the falls is 0.6 miles and gets a bit more strenuous as you’ll ascend far above the creek below. As you begin your ascent, listen below for the recently named and documented Jewel Falls (which will have a small feature later on in the blog). The trail will dead end at the base of Lick Creek Falls in a gorgeous grotto. Now, from here you can either return the way you came, which is a little under a 6-mile round trip, or you can return to the Lick Creek Trail and continue down to Princess Falls. If you decide to continue downstream, there are some things to consider as there are several creek crossings, four of them I believe. 1st, how much rain has there been? If there’s been a lot, I wouldn’t suggest visiting Princess Falls from this direction as trying to ford swift running water can be very dangerous. 2nd, do I want to get wet? Unless it’s been really dry, no matter what you’re going to get wet, possibly up to your knees as you make the crossings. If you decide to move on downstream the trail is a gradual descent and at around 1 mile (according to the National Park Service) you’ll meet up with Princess Falls. There are several perspectives to view the falls. You can view it from above, below, downstream and there are some nice trees in front of the falls to tie up a hammock and relax. The falls is not very tall, about 20 ft, but it is quite wide. To complete the point to point, continue downstream on the Lick Creek Trail and after a short distance the trail will intersect with the Sheltowee Trace National Recreation Trail, and before you will be the South Fork of the Cumberland River. Turn left and follow the Sheltowee Trace along the river to the Yamacraw Bridge parking lot approximately 1.2 miles away. As you walk the final section of the hike keep your eyes out for Julia Lynn Falls on the left, a wet weather waterfall that’s about 100 ft. upstream from the trail on a small side creek. If this waterfall is flowing really well, there’s a good chance Lick Creek is flowing pretty strong. The total for the point to point hike is 7.2 miles. Now another option if you only want to visit Princess Falls is to park at the Yamacraw Bridge parking lot and follow the Sheltowee Trace trail to the Lick Creek Trail, then follow it to Princess Falls. The total round trip is about 2.4 miles and it is on the easy side of a moderate hike. Keep in mind that when parking at the Yamacraw Bridge parking lot, put valuable items in your trunk. I have heard there have been break-ins of parked vehicles there. I was on the fence as to include this waterfall or not and for good reason. Access to this falls isn't for the casual hiker. It requires an off-trail steep descent and a final dangerous 25 ft. scramble to the base of the falls. 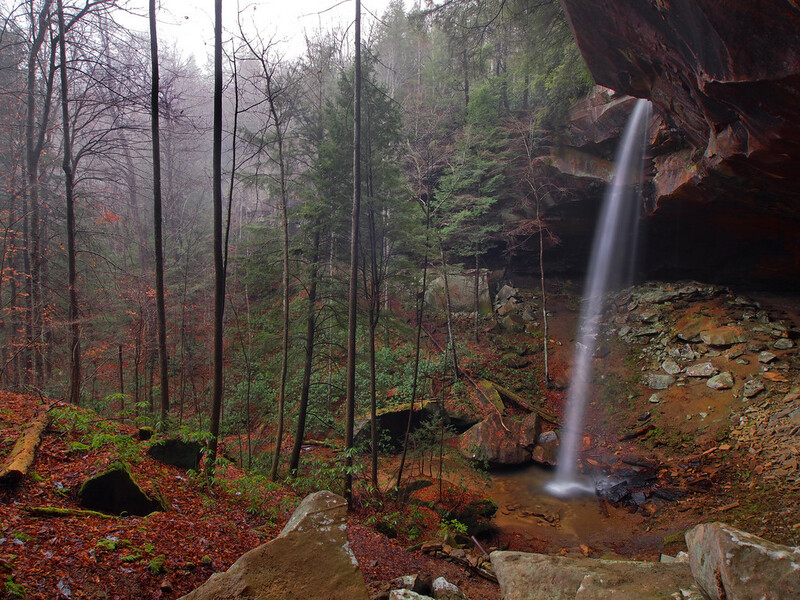 The falls is located on the Lick Creek Falls trail, near the beginning as you're making the ascent. Keep your ears peeled for the sound of falling water below. Now I’m sure you’re thinking that we’ve covered all the waterfalls in this part of Kentucky, but, no. We have not. Volume 1 and Volume 2 can be used together to do a complete waterfalling route. One could visit all the falls featured in both volumes within two or three days, depending on your hiking/driving pace. Volume 3 will pick up with close proximity to Princess Falls, with at least four more nearby waterfalls that will take us to Wayne County, Kentucky. So until then, happy waterfalling and get out there and explore Kentucky! Photographs by Bill Fultz, Christopher Morris and Greg Davis. I would like to thank both Chris and Greg for their input on Lick Creek Falls and the trails that lead to it.